1-2. I have now narrated to you, O King, this sublime poem on the glory of the Devi. 3. The Devi is endowed with such majestic power. By her this world is upheld. Knowledge is similarly conferred by her, the illusive power of Bhagavan Vishnu. 4. By her, you, this merchant and other men of discrimination, are being deluded; and others were deluded (in the past), and will be deluded (in the future). 5. O great King, take refuge in her, the supreme Isvari. She indeed when worshipped bestows on men enjoyment, heaven and final release (from transmigration). 6-8. O great sage, King Suratha who had become despondent consequent on his excessive attachment and the deprivation of his kingdom, and the merchant, having heard this speech prostrated before the illustrious Rishi of sever penances and immediately repaired to perform austerities. 9. Both king and the merchant, in order to obtain a vision of Amba, stationed themselves on the sand-bank of a river and practiced penances, chanting the supreme Devi-sukta (hymn to the Devi). 10. 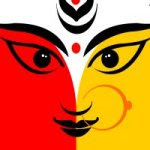 Having made an earthen image of the Devi on the sands of the river, they both worshipped her with flowers, incense, fire and libation of water. 11. Now abstaining from food, and now restraining in their food, with their minds on ther and with concentration, they both offered sacrifices sprinkled with blood drawn from their own bodies. 12. When they, with controlled minds propitiated her thus for three years, Chandika, the upholder of the world, was well pleased and spoke to them in visible form. 13-15. What you solicit, O King, and you, the delight of your family, receive all that from me. Well-leased I bestow those to you both. 16-17. Then the King chose a kingdom, imperishable even in another life, and in this life itself, his own kingdom wherein the power of his enemies is destroyed by force. 18. Then the wise merchant also, whose mind was full of dispassion for the world, chose that knowledge which removes the attachment (in the form of) ‘mine´ and ‘I´. 19-21. O King, after slaying your foes in a few days, you shall obtain your own kingdom and it shall last with you there. 22-23. ‘And, when you are dead, you shall gain another birth from the Deva Vivasvat (Sun), and shall be a Manu on earth by name Savarni. 24-25. ‘and, O the best of merchants, I grant you the boon which you have desired of me. (Supreme) knowledge shall be yours, for your self-realization´. 26-27. Having thus granted them both the boon that each desired, the Devi disappeared forthwith, as they were extolling her with devotion. 28-29. Having thus gained the boon from the Devi, Suratha, the foremost of Ksatriyas, shall obtain a new birth through Surya (and of his wife Savarna), and shall be the Manu(eighth) named Savarni, shall be the Manu named Savarni. Here ends the thirteenth chapter called ‘The bestowing of boons to Suratha and Vaisya´ of Devi-mahatmya in Markandeyapurana, during the period of Savarni, the Manu. Here ends the Devi-Mahatmya of 700 Mantras.